Beginning in version 2.9.18, Team Password Manager allows users to upload files in passwords and projects. You can upload any number of files to a password or a project. Only users with permission to edit a password or project can upload files to it. Only users with access to a password or project can download files from it. Files are saved encrypted (their name and content). You can configure the uploads folder to be located wherever you want in the server folder structure. The maximum file size can be adjusted using PHP settings. Press "Upload file". You'll be taken to the upload file screen. If you don't see this button it means you can't edit the password or project, so you can't upload files to it. Select the file you want to upload. You can see the maximum file size below the file select button. Enter some notes if you want. You can always change these notes later if you want. Press upload. 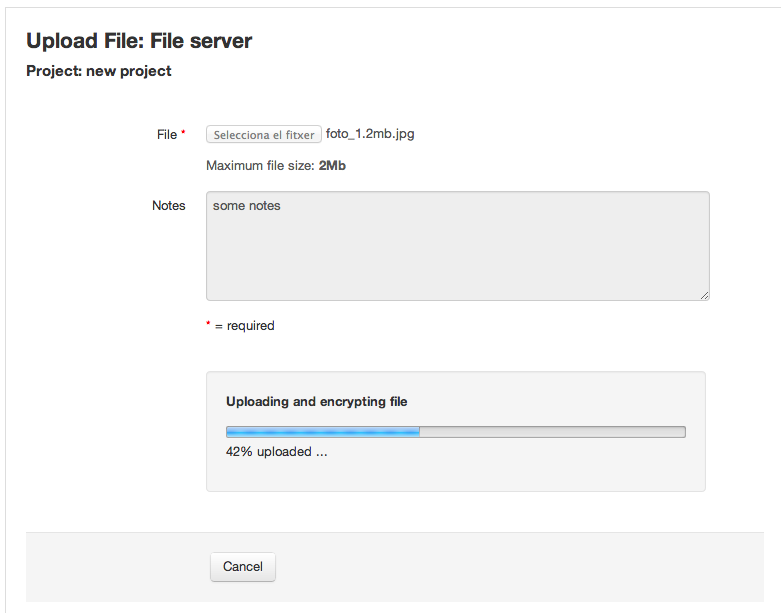 When the upload process finishes you'll be taken to the "Files" tab in the password or project. Downloading is even easier than uploading. Just go to the password or project you want to download a file from, select the "Files" tab (if you don't see this tab, it means that the password/project doesn't have files) and click the "Download" button for the file you want to download. upload_max_filesize: the maximum size of an uploaded file. post_max_size: when uploading files, you're posting a form, this is the max size of post data allowed. In Team Password Manager it includes the size of notes field. It should be larger than upload_max_filesize, specially for large files. memory_limit: the maximum amount of memory in bytes that a script is allowed to allocate. It should be larger than post_max_size. When uploading a file, Team Password Manager checks these values and shows the lowest of the three in the "Maximum file size" label below the "Select file" button. Chek also the following PHP doc: http://www.php.net/manual/en/ini.core.php#ini.post-max-size. Files uploaded to Team Password Manager are stored in the uploads folder. This section explains some things you should know about this folder. For security, we recommend that you locate the uploads folder out of the public folder of you installation. 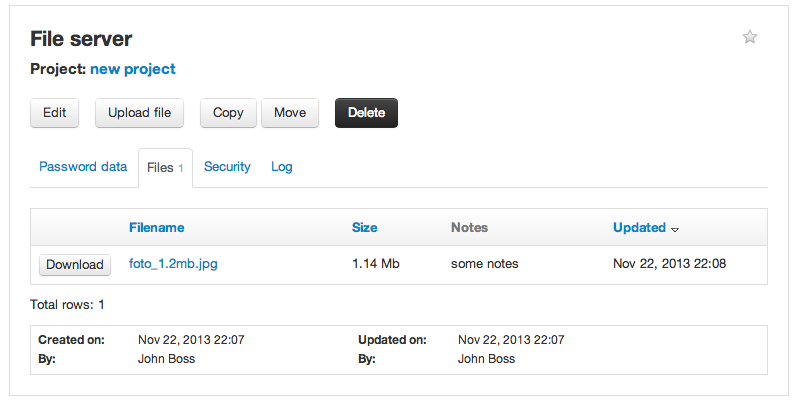 For instance, you can locate it right above it by setting it to '../uploads/'. Team Password Manager creates and deletes files and folders in the uploads folder, so you should give it read and write permissions for the web server. Team Password Manager will check these permissions before uploading any file, and will prevent file uploads if the permissions are not appropriate. # even if the file extension is ".php". If you upload some files and then take a look at the uploads folder, you'll see a bunch of folders and files with meaningless letters and numbers. Also, if you try to open any of the uploaded files, you'll only see garbage. Don't panic! Team Password Manager stores the uploaded files encrypted. It encrypts the filename and the content using the same method it uses to encrypt the fields of a password. So, you'll only be able to get (download) the unencrypted files through Team Password Manager itself, making it a secure vault for your organization's files.